What was it like to grow up Jewish in Italy during World War II? Sit with a little girl as her grandmother tells the story of her childhood in Rome, of being separated from her father, and of going into hiding in the mountains. 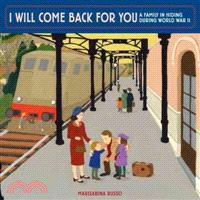 Based on the experiences of the author's own family, this deeply moving book set during the Holocaust deals with a difficult subject in a way that is accessible and appropriate for young readers. I Will Come Back for You is an incredible story of bravery and kindness in the face of danger. MARISABINA RUSSO is the author and illustrator of numerous books for children. Her picture books include A Very Big Bunny, a Junior Library Guild Selection; The Bunnies Are Not in Their Beds, which was called "fresh and engaging" by Booklist; and Always Remember Me: How One Family Survived World War II, based on the experiences of her grandmother's family during the Holocaust, which was named an ALA-ALSC Notable Children's Book. Visit her at MarisabinaRusso.com.